Each year, in lieu of client holiday gifts, The Medicus Firm donates to a charity that is nominated and voted upon by TMF associates nationwide. The Medicus Firm, a national physician search firm, donates the money on behalf of its clients - hundreds of hospitals and health systems across the country. For 2018, the charity selected by TMF associates to receive the annual donation is The Wounded Warrior Project (WWP). The Wounded Warrior Project is a non-profit organization that offers a variety of programs and services to veterans who incurred a physical or mental injury while serving in the military on or after September 11, 2001. The WWP mission is to ensure that returning service members and their families have the proper resources to rehabilitate and readjust to civilian life. 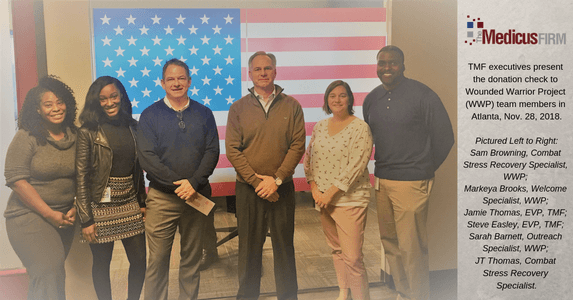 On November 28, a check was presented to the WWP team in Atlanta by Jamie Thomas and Steve Easley, executive vice presidents in the Atlanta TMF office. The firm used to send out small holiday gifts as tokens of appreciation to each client. "We are happy to be able to give back to the community, and provide this donation to such an important cause," states Krista Jackson, office manager and HR representative in TMF's Atlanta-based division. "We have worked with the Wounded Warrior Project in the past, and enjoy helping this organization with their mission because we all owe so much to our veterans. TMF employs several US military veterans, and additionally, many TMF associates have family members who have served in the military, so this a cause that touches all of our lives in some way." "As our company grew over the years, and the number of clients has increased, it made less sense to send gifts which may get tossed aside, thrown away, or forgotten," states Jim Stone, president of The Medicus Firm. "We wanted to do something more meaningful on behalf of our clients, in honor of them. We feel that donating to a deserving charity in need is a great way to recognize and show appreciation for our valued clients during the holidays, when families often need help the most." The Medicus Firm was founded in Dallas, TX on September 12, 2001, one day after the terrorist attacks of 9/11. "That was a pivotal, trying time for our country, and many civilians were inspired by the events of 9/11 to sign up to serve our country and fight the terrorists. The Wounded Warrior Project has helped so many veterans and their families since 2001, and we hope our donation helps them advance their mission to assist even more military families in need of support," Stone adds. Ongoing philanthropic activities and opportunities to give back to the community are among the many ways The Medicus Firm continually engages associates beyond the typical office duties and workplace tasks. “Our associates enjoy coming together as a team several times a year to volunteer time and raise money for a number of charitable causes to help fellow citizens in need,” states Megan Williams, Director of Employee Engagement. The TMF teams in Dallas and Atlanta have been involved with numerous non-profit organizations in their respective metro areas. Dallas-area charities include Brady Senior Services Center and ChildCare Group. The Atlanta office has volunteered at Georgia SPCA, and Children's Healthcare of Atlanta (CHOA). TMF plans to get clients more involved with the giving process next holiday season. Clients will be able to help choose the charity that will receive the annual holiday donation by completing a survey that will be sent out via email.